Planetarium show for pre school. Music, songs and fun. This Pre school Planetarium Show is a gentle and fun planetarium show for pre school, which introduces the young learners to the wonders of the Universe. In this show, we will look at the stars and spot animals in the constellations as they move overhead. Some children may even learn how to identify stars and constellations in the real night sky. Discover some shapes in space by looking at items in space and learning that some are round like a ball and some are flat like a pancake! Begin to understand that we live on a planet and there are other planets too. Look at planets Earth from a distance and see where we belong in the solar system. How big is Earth and how big are the other planets? How many planets are in our solar system and what are the other planets like? In this show, we make sure there are lots of opportunities for music and singing. Our aim is for the younger children to begin to enjoy space and develop a thirst to understand more as they get older. The images and videos used in this show are chosen specifically for their age. The feedback we have received from this planetarium show for pre school is that the young children absolutely love it! the excitement of entering a huge ‘tent’ and then being sent travelling through the universe on a space rocket is just wonderful. 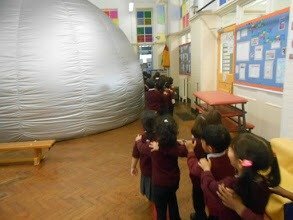 This planetarium show for pre school can be adapted for different ages and groups depending on need. The aim is to show each person that the Universe is a wonderful place and that there is so much to see. The mobile planetarium creates a magical learning environment to learn about the wonders of space.